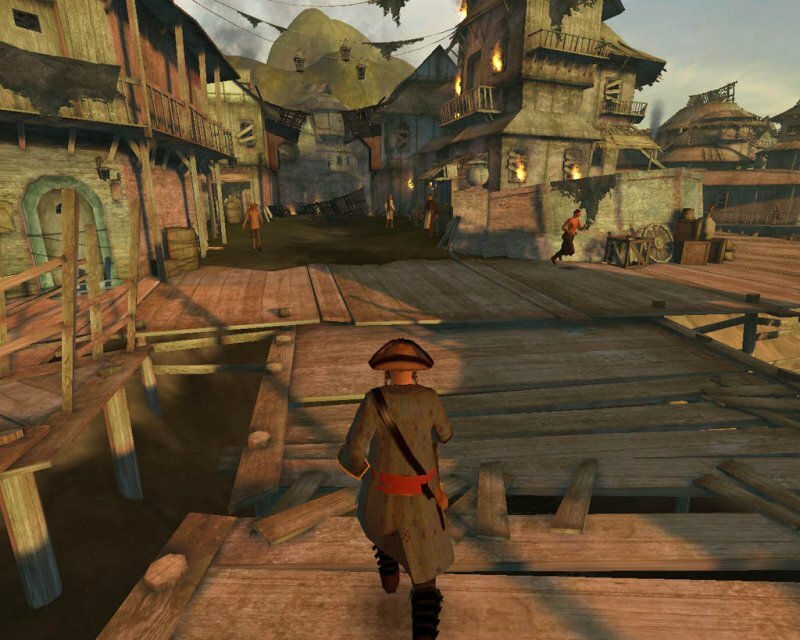 Pirates of the Burning Sea has been in development since 2002. During the first few years of development, Flying Lab Software realized that this project required more attention than anticipated. Gradually, not only have they more than doubled their staff, but have also put a MMO entitled Delta Green (based on the role-playing game of the same name), on hold. The release date has been set as January 22nd, 2008. Players who purchase the Pre-Order will be able to start playing on January 7th, 2008. 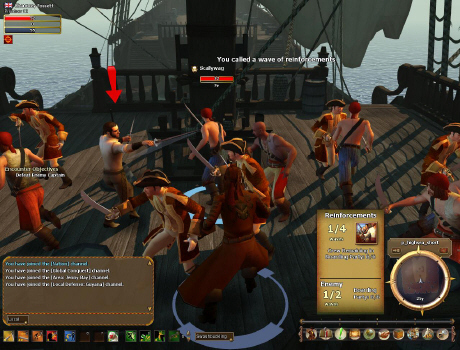 Players in Pirates of the Burning Sea will create up to six avatars per server to represent themselves in the game. 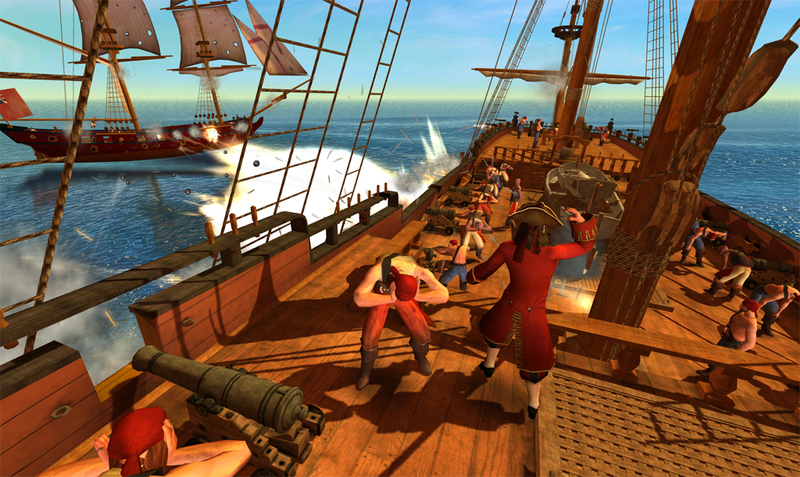 All avatars will be captain of their own ship, and will fight either for a nation of their choice or as a Pirate (see below). As the player moves along in the game the avatar will develop by gaining ranks (known in many other MMO's as levels). Through development the player can unlock new features, fighting abilities, and most importantly will be able to captain bigger and better ships. The maximum rank a player can reach is 50, and it is said that this can be reached through around two months of casual gaming. When the character is first created the player will have to choose a nation to join. This can be any one of either Britain, France, Spain or the Pirates, known as the Brethren of the Coast. Players are restricted to one nation per server, and this choice can only be undone by deleting all characters on that server. Each of the four nations will have different starting ports, and therefore access to different resources at the start of the game. After a player has chosen a nation, he will be able to customize the looks of his avatar. These will be alterable in-game and do not affect gameplay directly. There are thousands of different combinations available to the player, who can freely specify each of the 14 different slots. Most items allow color customization to further personalize the avatar's look. The avatar's appearance is also based on level. The more impressive and intricate clothing is restricted to higher level avatars. Certain items, such as peg legs or hooks for hands, must be earned through completing higher-level missions. 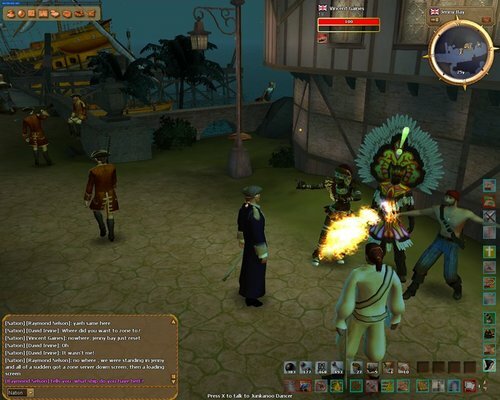 Swashbuckling is the name given to avatar combat in Pirates of the Burning Sea. Players select one of three fighting styles to learn and use that style to duel each other or any of the various NPCs they might encounter. Swashbuckling is based on a fighter's ability to manage their opponent's balance. Each participant will have a balance meter which is used to determine how capable a character is of parrying, blocking or dodging an attack. Players will use Preparatory Attacks to lower their opponents balance, and then use offensive attacks to deal damage. Players and NPCs alike will aim to reduce their opponents balance meter while keeping their own alive. The player must choose one of three fighting styles and will, through leveling, gain points every other level to spend in the chosen style. There are a total of 45 skills for each fighting style. The skill tree is composed of 9 skill chains that are each 5 skills in depth. A player will be able to reach the end of a single skill chain by Rank 15, and is then considered somewhat equal to a Rank 50 in that skill chain. Dirty fighting - Fight with a cutlass. Excels in disrupting the balance of the opponent and has many 'special' attacks. Fencing - The art of fighting with a rapier. Excellent at dealing high amounts of damage. Florentine - Dagger and sword fighting. Has the greatest defensive capabilities. As it stands there are approximately 54 ships in the game, with the aim to add more over time. 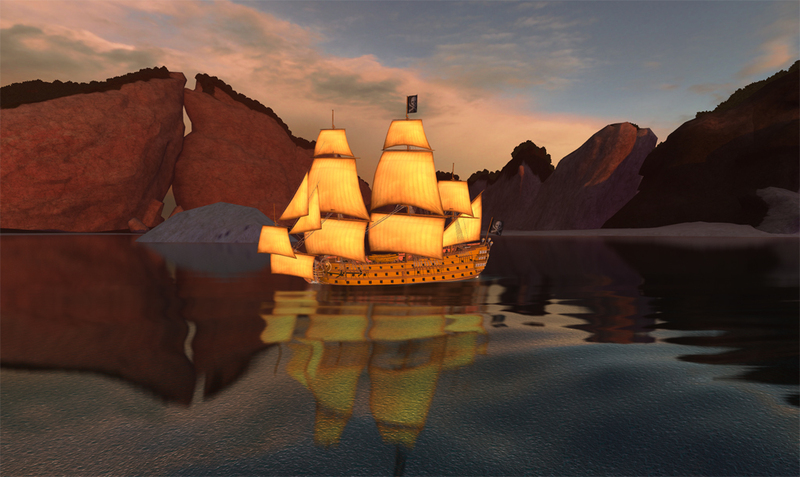 What ship the player chooses to sail will affect both his combat capabilities and his economic capabilities. Most of these ships have been User Created (see Customization below). As a general rule, the bigger the ship, the less maneuverable it is. This means that even though a ship is bigger and has more and heavier cannons, it will not necessarily be the better choice. Because of the way combat works, ship speed and maneuverability has a great effect on combat. Small ships, especially in large groups, will in many cases be able to beat larger ships solely because of this. However, the developers have stated that smaller ships are not designed to take out larger ships in a one-on-one stand off, but to play support roles to other ships such as harassing the enemy ships. Ships of different sizes will also have different cargo hold sizes. This is especially important to free-traders. The more cargo you can bring from one port to another, the more you will be able to earn on a single trip. Merchant ships are generally less armed than warships, but have more cargo space. A player will be able to own three ships at anytime. Though only one can be sailed, the others can be docked in port, fitted and ready for action. The player will also be able to transfer himself directly from one docked ship to another. This means that the player will have easy access to any of his three ships, no matter how far away it is. It will also mean that the player will be able to more easily cover the different playing styles. Stripped – A merchant variant. A low-level requirement version of a large trade ship although not equipped with guns. Courier – An easy-access variant. Courier ships are slightly faster and easier to handle, but they have less firepower and armor. Heavy – An upgrade variant. Heavy ships have significantly more armor and structure, and often have other combat benefits. Sleek – An upgrade variant. Sleek ships are faster and handle better. They might also have slightly better armor. Mastercraft – The premier ship variant. Mastercraft ships are expensive custom made ships that have been restructured to have room for more (and potentially heavier) guns and stronger hulls.